Today there are people advertising their services as “life coaches” who offer mentoring in “life skills.” This is nothing new. The wisdom teachers, or sages, in ancient Israel were in the same business. Wisdom in the Bible is not to be confused with what we call IQ. It is not primarily something intellectual, though it does have an intellectual aspect. It is primarily about life skills — the ability to cope with the demands of life. So people who had the skills to work on the construction the tabernacle are described as “wise of heart” (Exod. 31:6, often translated as “skillful”). Sailors able to navigate across the sea are called “wise” (Ezek. 27:8). Solomon was given “wisdom” in response to a prayer for the ability to rule well (1 Kgs. 3:9, 12). The whole book of Proverbs is a manual on life skills: marriage and family life, friends and neighbors, care for the poor, agriculture, commerce, behavior in the law courts and in the royal court, and the right and wrong uses of speech. The primary “life coaches” in Proverbs are parents (1:8; 6:20; 10:1; 15:20; 31:1). In Proverbs 1–9 and 30–31 the coaching is given in the form of lessons delivered by the parent, interspersed by occasional poetic pieces. The speaker is usually the father and the child addressed is always the son. Some modern translations obscure this by using the word “child.” This strong gender-specific bias of Proverbs may sometimes make it seem irrelevant or difficult for women readers. Such a problem is not unique to Proverbs. All the books of the Bible, like all literature, come from, and address, specific historical and cultural situations. This can make them seem irrelevant or problematic for us. If we want to apply their message to our lives and situations today we have to face the task of cultural transposition of the message. This involves imagining ourselves in the place of the original addressee(s) in order to understand what the message of the book was for them. We then have to consider prayerfully and imaginatively how it might apply to us today in a different historical and cultural setting, whether we are women or men. The coherent form of the lessons makes it relatively easy for a modern, Western reader to understand their message. It’s a very different matter with the material in Proverbs 10–29. It seems to be an incoherent, haphazard collection of short proverbial sayings. The reader has to intuit the appropriate context for a proverb. Proverbs have to be used wisely if they are to be of value. Most scholars do treat Proverbs 10–29 as a random collection of sayings. A few have looked for some coherent structures in these chapters. In my commentary I have built on the work of Knut Heim and Bruce Waltke who have tried to identify such structures. I have used a modification of the criteria they used to identify “clusters” of proverbs. Not all the proverbs in these chapters can be put in clusters, but most can. I think this is significant for how the reader should understand and use the proverbs. 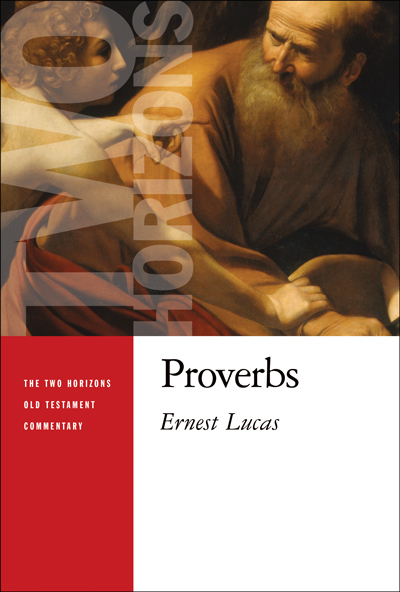 A speaker cannot decide what the right context in which to use a proverb is without having some idea about its possible meaning(s), and this has to arise from reading it in a collection in Proverbs. Given the importance the sages placed on the right use of proverbs (26:7, 10), it is not unreasonable to at least consider whether the compiler(s) have given some help with this by the context in which they have put a proverb. The cluster in which a proverb occurs may give the reader guidance on its meaning and the real-life context in which to use it. Readers of my commentary can judge whether this is the case. Ernest Lucas is vice principal emeritus of Bristol Baptist College and an honorary research fellow in theology and religious studies at the University of Bristol. He has also written Exploring the Old Testament: The Psalms and Wisdom Literature and commentaries on Daniel and Ezekiel.